For Father’s Day, for celebrations year-round or for general gifting, here’s something few others will be making: Chocolate Bacon Potato Chips. The bacon is optional: chocolate-only is just as delicious. These sweet-and-salty chips are a favorite at parties, and disappear quickly. We recommend dipping the chips most of the way, instead of completely enrobing them, to keep chocolate off of the fingers. It’s also faster; and no dipping tools are required. Don’t want chocolate? 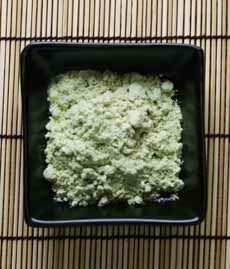 Make the wasabi-dusted potato chips recipe below. 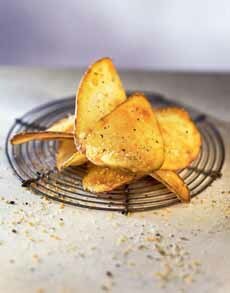 Ridged chips are better because they are flatter, making them easier to dip. The quick version is to purchase quality potato chips instead of making your own. But we make our own easily with this Mastrad microwave chip maker. The better the chocolate, the tastier the chips. If you want glossy chocolate, you need to temper it (here’s how to temper chocolate). But no one will notice if the chocolate is dull rather than shiny. If you care about the taste of chocolate, never use candy coating. It doesn’t melt in the heat, it doesn’t require tempering, but it doesn’t taste good. If you want to make the chips part of a dessert, we suggest a slightly tart-sweet counterpoint, like vanilla frozen yogurt. 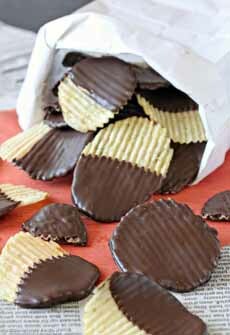 Chocolate-dipped chips are best eaten the day they are made, when they are the crunchiest. Ridges work better (photo courtesy The Spruce). Variation: Top the chocolate with crumbled bacon (photo courtesy iGourmet). 1. PREHEAT the oven to 350°F. Line a baking sheet with parchment paper. 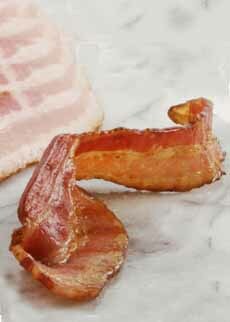 Set the bacon slices on the parchment and sprinkle each slice with brown sugar, then with the red pepper flakes. Bake for 10-12 minutes until they are cooked completely. Set aside to cool. Once cool, dice the bacon into ¼” pieces. 2. REPLACE the pan lining with parchment or waxed paper or and set aside for the dipped chips. 4. HOLD a chip at one end and dip it into the chocolate about 80% of the wa, leaving an un-dipped edge at the end for neat pick-up. Hold vertically and let the excess chocolate drip into the bowl, and tap the chip against the edge a few times to remove the excess. 5. PLACE the dipped chip onto the parchment and sprinkle with a few bits of bacon. Repeat for the rest of the chips. 6. REFRIGERATE the chips for 10-15 minutes to set the chocolate (no longer; they’ll get soggy). Alternatively, cool for 1 hour at room temperature, or place in the refrigerator for one minute. This recipe was developed by the Idaho Potato Commission. You need to make your own chips, so the spice mix can stick to the hot chips. 1. PEEL the potatoes and slice into desired shape: 1/2-inch sticks, wedges or 1/8-inch thick chips. Rinse and pat dry. 2. HEAT the oil in a deep fryer or deep-sided saucepan, to 275°F. Blanch potatoes for 5 minutes, cooking in batches as necessary. Drain and set aside on paper towels until ready to serve. 3. BLEND dry seasonings and set aside. 4. INCREASE the oil temperature to 350°F. Cook the fries until golden brown, 3 to 4 minutes for sticks and wedges and 1 to 2 minutes for chips. 5. SPRINKLE the hot fries with the seasoning mix. (We tossed them in a large pan using protective gloves. It was a happy accident! So many types, so little time!